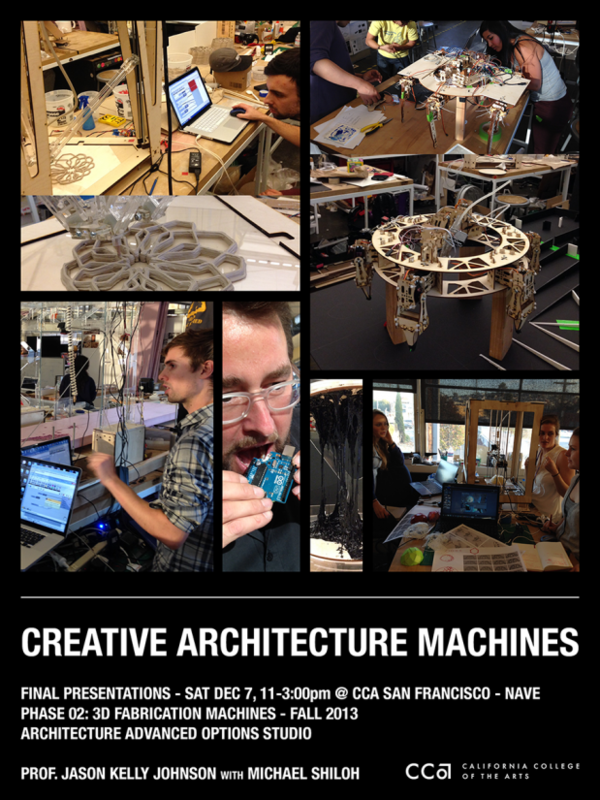 This semester Assistant Professor Jason Kelly Johnson taught a new advanced architecture studio at CCA San Francisco called “CREATIVE ARCHITECTURE MACHINES”. Students began by making 2D robotic drawing machines (see the results here) and then they designed and built their own custom 3D fabrication machines. The final few weeks of the semester were focused on creative output using Arduino and the Firefly plug-in for Grasshopper (Jason is the co-developer). The final public review was on Saturday, Dec 7 2013 in the CCA Nave. Jason co-taught the studio with the amazing Michael Shiloh who wears many hats including the community liason for Arduino. Share: all projects are now on YouTube and published open-source on Instructables. Jeremy Blum from Google X also recorded most of the final review using Google Glass - it is a pretty amazing collection of images and videos! Press: See recent press coverage: 3D Printing Industry blog, Hackaday, Architect Magazine by curator Aaron Betsky and more. Exhibit: The Geoweaver robot and printed artifacts will be in the Possible Mediums show at University of Michigan TCAUP on 17 Jan 2014. CCA Jury Prize Fall 2013: Congrats to Ugrads Taylor Fulton and Max Sanchez for winning the all-CCA Jury Prize for outstanding architecture studio projects. View their Stratum Networks video here and Instructable here. Jon Proto & Brandon Kruysman (Bot & Dolly / Google), Brian Harms (Samsung R&D), Jeremy Blum (Google X), Pablo Garcia (SAIC), Aaron Betsky (Director of the Cinncinati Art Museum), Bill Meyer (Director of New Media, Exploratorium), Mike Petrich and Karen Wilkenson (Founders of the Exploratorium’s Tinkering Studio), Gian Pablo Villamil and Karl Willis (Autodesk), Andrew Kudless (CCA & Matsys), Mark Cabrinha (Cal Poly), Josh Zabel (Kreysler & Assoc), Andrew Maxwell Parrish (CCA Hybrid Lab / Intel Technologist-in-Residence). Participants will explore these ideas through the iterative prototyping of actual living, breathing, working technologies. In Phase 01 of the semester students will create two-dimensional (X,Y) robotic “drawing machines” that respond to indeterminate inputs (sun, wind, sound, etc.) from their environment to create novel drawings, paintings, drippings, etchings, compositions in light and pixels. In Phase 02 students will create four-dimensional (X, Y, Z plus time) machines for the production of a radical new class of domestic dwelling unit. During this phase students will create desktop fabrication machines that approximate full-scale processes at an architectural scale. Students will work back and forth between processes of design, prototyping, playing, hacking, coding, learning and feedback.